This park can not exist without volunteer help and there is a job for everyone regardless of age! Please donate an hour of your time today. No matter your age or how much time you have available, we can find a job for you! Most jobs can be done while your kids play and can even include your kids. What an easy way to teach your children the importance of giving back while having a ton of fun. Look for announcements on Facebook about our community clean up days! Is your organization looking for an outing that gives back? 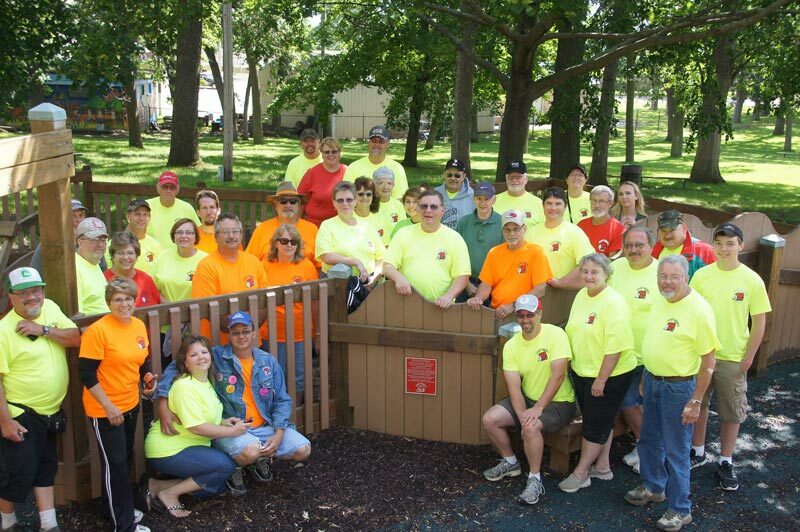 Join several organizations each year that have a blast tackling some of our bigger projects like leaf raking. Just 2-4 hours of soaking up sunshine and breathing fresh can do wonders for your employees AND for the Dream Park! Can’t find a job that works for your organization? Do what the Road Apples did. They donated a portion of the proceeds from their car show for several years in a row and gave over $3,000 to the park for improvements and upkeep.